I have been participating in the local farmers market lately which has giving me access to local prime vegetables. My buddy Frank had planted pumpkins behind his Grandmothers house and he gave me a few for halloween. I like pumpkin, to eat, and came up with the following. Smells like something I would eat. 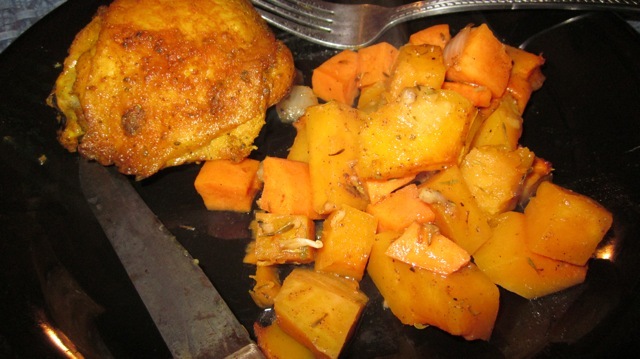 Served with a curry style rubbed chicken. 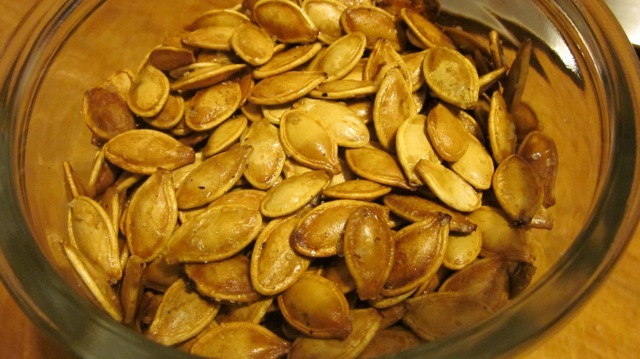 And then roasted the seeds, yum! You can call it what you like. 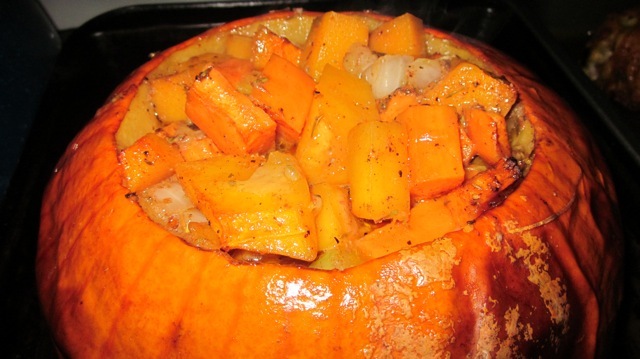 I named it Jamaican Pumpkin Bake. 1 7or8 inch pumpkin, gutted. 1 Tablespoon Knox's Jamaican Jerk dry rub spice blend or whatever jerk rub you like. 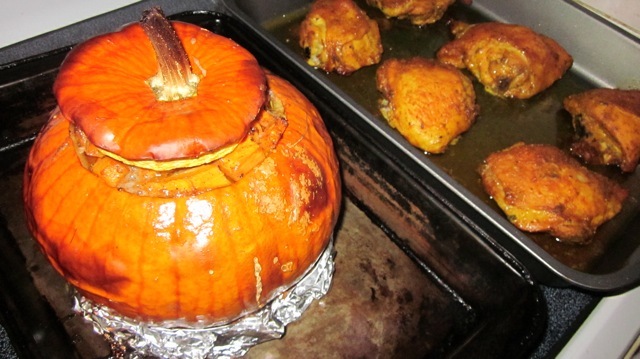 Put the pumpkin on a baking pan. I put a ring of foil around it to make it more stable. 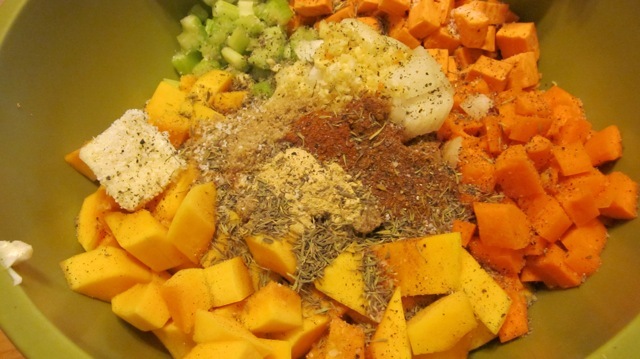 Toss everything except the chicken stock together in a bowl. Put it in the pumpkin with the chicken stock. I baked it at 400 degrees for 1-1/2 hours. I'm thinking I might like that. Cool idea! Hey Brian, that's a great way to get rid of those leftover jack-o-lanterns! Just make sure you do it before the green fuzzy stuff appears. And remember to take out the candle before baking it. I'm going to try this one out. LOL! @Lew. 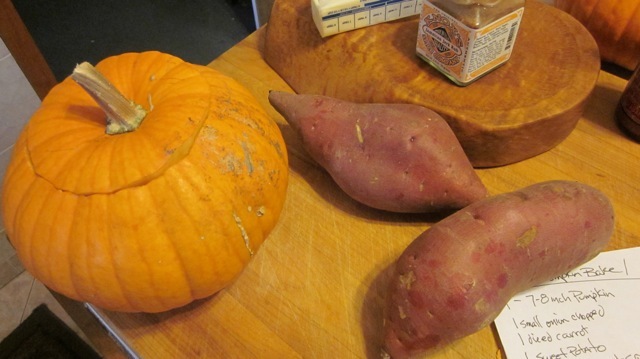 If I stuffed one of my Jack O Lanterns with the squash and potatoes it would like it was puking. Maybe next year. I will call it the cannibal vegetable with eating disorder. HAhahaha! On a more serious note; It was really good although my wife served it different than I was going to. I wanted to scrape a bit of the pumpkin out with the squash and such. 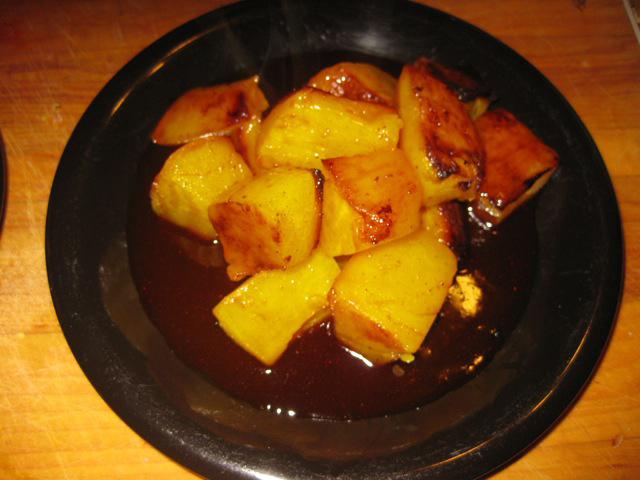 The flavor was savory and not to overpowering, like when I put to much jerk on. I have some of the innards in the fridge I am going to pan bake tonight, possibly with golden raisins and bourbon. We will see. That should be good Bryan. About 30 years ago, I was a struggling photographer in New York and I went to an artist retreat in upstate New York at a place called Pumpkin Hallow. 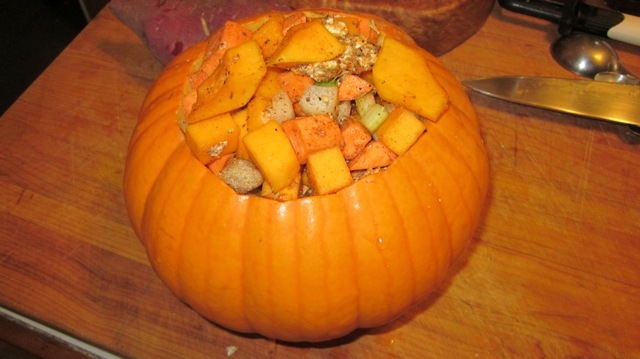 It was on a farm and they served this baked pumpkin that was coated on the inside with honey and other spices. It was put on the table whole and then cut into slices like you would a squash. That thing was really tasty. Your rendition sounds like it would be great. Thats funny you mention a dessert Lew. I was able to go eat at a Mayan place in Brookfield back in the summer. Two things I am going to learn to make from there; Mayan pulled pork and the pumpkin dessert I had. I need to go back and get the pulled pork again and ask some questions but I can pretty close to replicating the pumpkin dessert. I will dig up the recipe and post it. I know I did somewhere but not sure if it was here. I always thought to get a nice pumpkin flavor, you had to use the green ones.